A little more than a week ago, I posted my first take on Twitter and argued that even in the absence of financial information from the company (since the prospectus had not been filed yet), you could price the company. Based on prior transactions in the company (VC infusions and acquisitions) and the multiples of revenues/users for other companies in the space (the social media medley, as I called it), I argued that Twitter would be priced at about $12 billion by the bankers. Before I embark on the ambitious task of forecasting the future, I will begin by looking at the company as it stands now. The financial filings paint the picture of a young company with little in terms of conventional earnings or cash flows to back it up, but plenty of promise (a dangerous word). Let’s start with the income statement. In the table below, I list the company’s key income statement numbers from 2010 to 2012, with the 2013 data in the last three columns. The numbers paint a picture that should not be surprising. The company’s revenues have grown rapidly, with the revenues in the first 6 months of 2013 jumping more than 100% from the revenues in the first 6 months of 2012. Notwithstanding the jump, though, the revenues over the twelve months ending June 30, 2013, were only $448 million (which is well below the rumored $583 million that I used in my pricing post). The company has reported operating losses through its entire life, though to be fair, R&D expenses account for a chunk of the operating expenses. The company does report an adjusted EBITDA, and while the trend is positive, I cannot read much significance into a number that is based on the fiction that employee expenses can be added back because they are non-cash. Allowing for the fact that R&D is really misclassified capital expenditures (by accountants) and assuming a 3-year amortizable life for R&D does improve the operating income somewhat, as does the capitalization of operating lease expenses (moved to debt). Even with this improved operating income, Twitter’s pre-tax operating margin is barely positive (0.96%). These numbers illustrate how completely useless accounting balance sheets are at young firms, especially in technology. In fact, the only number in this balance sheet that has any relevance is the cash balance, with the intangible asset item measuring none of the true intangibles and goodwill playing its usual (and useless) role as plug variable. I capitalized their past R&D expenses and am showing it as an asset. The book value of equity is negative but as an investor, that tells me nothing, and the shift to a positive book value of equity in the pro forma statement matters even less. The company has little debt (a capital lease) and a series of convertible, preferred share offerings, reflecting its multiple VC capital infusions, which will get converted to equity on the public offering (removing a major headache in the valuation). Comparing Twitter’s financials to Facebook’s at the time of its public offering (see my valuation of Facebook on the day before its offering) should make it clear that Twitter is much earlier in its growth path than Facebook. Valuing a company, just ahead of a public offering, is tricky for multiple reasons. The first is that there is a feedback effect from the offering itself, since the cash retained from the offering augments the value from the firm (if the founders don’t cash out). The second is that the share count is a key and shifting number, with conversions of other types of securities (preferred in this case) and shares used in employee compensation (restricted stock units (RSUs) and options) overhanging per share values. Magnitude of the initial offering: While this may be putting the cart before the horse, the first number that you need to estimate is the dollar value that the company hopes to raise in the initial offerings. 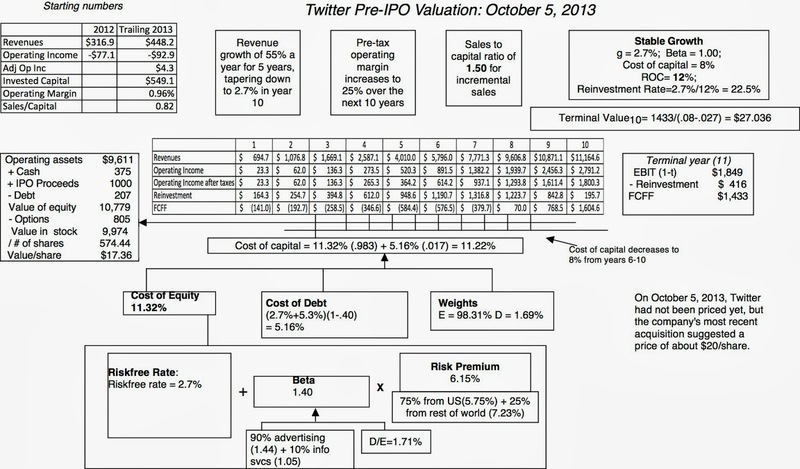 In most IPOs, only a small fraction of the company is offered and Twitter seems to be no exception. This news story suggests (and I tend to believe it) that Twitter plans to raise about $ 1 billion in the offering, at a stock price of roughly $20/share. Note that I am not suggesting that this is the right value for the share and it will really not affect my valuation. Use of the offering: On page 16 of the S-1, Twitter specifies that it plans to retain the proceeds from the offering in the company and use it to cover investment needs (acquisitions, capital expenditures and working capital). That effectively means that the day of the offering Twitter’s cash balance will increase by roughly $1 billion, if that is the offering amount. (In some IPOs, the founders of the company cash out a portion of their ownership and take the offering cash out of the company. In that case, it would not augment the cash balance). Post-offering shares outstanding: As I noted in the last section, Twitter has a whole series of convertible preferred offerings. On page 17, the company notes that all of the convertible preferred shares will be converted into common shares, removing one potential entanglement. On the same page, the company specifies that it expects to have 472.613 million shares outstanding after the offering, but then proceeds to say that this number excludes 44.157 million employee options (potentially convertible to shares), 86.915 million shares of restricted stock units (also granted to employees), 0.117 million shares issuable on a warrant and 14.791 million shares to be issued to MoPub stockholders as payment for the acquisition. There is absolutely no valuation basis for excluding these shares and the total number of shares that I will use in my per share value is 574.44 million (472.613+86.915+0.117+14.791). The options also represent a claim on equity value, but I will deal with them separately. The value of Twitter lies in what it can do with its 215 million users (the estimate in the S-1) rather than what it has done in the past. This is the section where I am sure that we will have to agree to disagree but the following sections summarize my assumptions. There are two factors to keep in mind. The first is that the online portion of the advertising market is continuing to capture a larger share of overall advertising revenues (as attested to by the woes of print and traditional media companies); applying a 5% growth rate to 2013 online ad revenues yields a value of $190 billion for the overall market in 2023. The second is that there is a large segment of the market currently that is splintered among thousands of other companies, some conventional press media and many very small. Thus, the good news for Twitter is that there is a large potential market, but the bad news is that there will be plenty of competition from both the existing players and new entrants. In fact, one interesting and disquieting aspect of the inflation of market values of many of the companies on this list is that the market does not seem to be factoring in the finite size of the overall market. Thus, Google's current market cap implies that market expects its revenues will increase to $75 billion by 2023 and Facebook's market cap implies a revenue of $60 billion for that company; if the market is right, those two companies alone would account for 60-70% of the overall market in 2023. I do think that Twitter starts with some advantages. While it does not have Facebook's user base (or expansive interface) and Google's easy reach, it does have a much-used and unique platform and an active user base. I will assume that Twitter's revenues will reach $11.5 billion in 2023. That will be more than a twenty fold increase in revenues and translate into a revenue growth rate of 55% for the next 5 years, scaling down to stable growth (of 2.7%) in year 11. 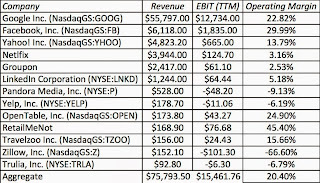 It is difficult to compare margins across these companies, since some (like Netflix) derive all their revenues from subscription revenues, some (like Pandora) have a mix of advertising and subscription revenues and some (like Google & Yahoo) are search engines. The company that is closest to Twitter in its advertising revenue model is Facebook and the company delivers an impressive 30% pre-tax operating margin, but Facebook's margin has shrunk as its revenues have grown. Will Twitter be as profitable as Facebook? There are news stories that suggest that Twitter gets less revenues from advertising per user than Facebook, but those may be reflective of where Twitter is in its growth phase. Twitter, with its 140 character limit, has a more constrained format for ad delivery but may work better in mobile advertising (which is the cutting edge of online advertising) than Facebook. Overall, though, I would anticipate Twitter to have a slightly lower operating margin (25%) than Facebook does now (30%), especially since Facebook's margins will also compress over time. 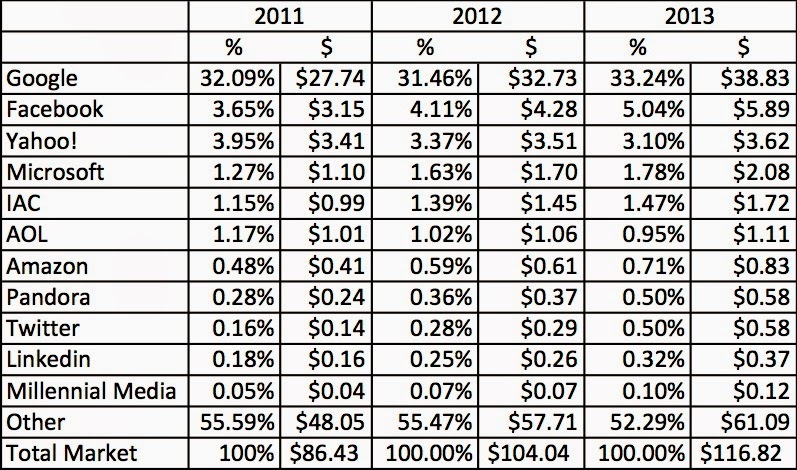 Note that for Twitter, I have computed the ratio of incremental sales to reinvestment each year from 2010 to 2012, and that my reinvestment number includes acquisitions, change in working capital capitalized R&D and is net of depreciation. 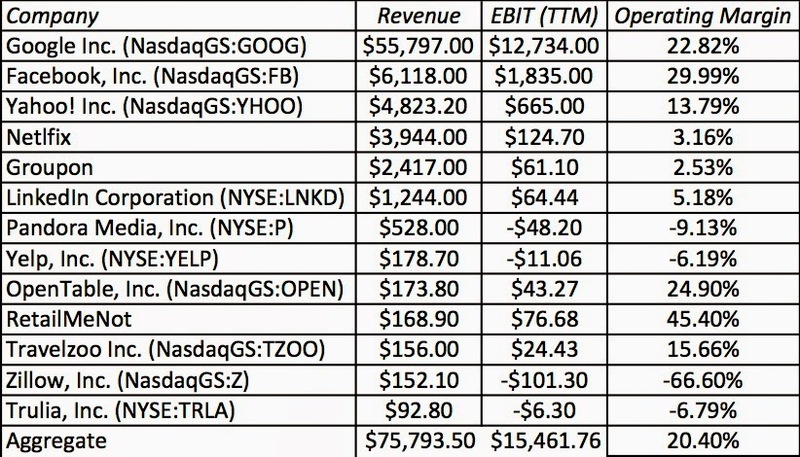 I have also computed the total sales to invested capital for Twitter, Facebook and the sector in 2013. While Twitter's incremental sales to reinvested capital ratio has risen over time, it is still below the industry average. Put in intuitive terms, Twitter is spending large amounts (on R&D and acquisitions) to deliver its revenue growth and you have to hope for improvement as the company gets larger; Twitter specifically forecasts about $225-275 million in acquisitions for 2013 (S-1, Page 51). Based on these data, I assume that for every $1.50 increment in future revenues, Twitter will have to invest a dollar in capital; this allows me to estimate the reinvestment (including net cap ex, change in working capital, R&D and acquisitions) each year. Geographic mix: While Twitter generated very little of its revenues from outside the US in 2011 and 2012, about 25% of its revenues came from the the rest of the world in 2013. Using an equity risk premium for the US of 5.75% and a GDP-weighted average equity risk premium of 7.23% for the rest of the world, with the current weights of 75% and 25% for each, yields a value of 6.15% for Twitter. Given that Twitter now has far more followers outside the US than in the US (S-1, Page 67), the proportions and equity risk premium may shift in the future. Financing mix: Twitter has capital leases of $71 million and the capitalized value of operating leases is $127 million. Collectively, debt accounts for 1.69% of capital and Twitter's cost of capital, given these assumptions, is 11.22%. NOL & Taxes: The company's operating losses have resulted in a net operating loss of $468 million (S-1, page 217) which I use to shelter the company's income, when it does start making money, from taxes. As a result, I do not expect the company to pay taxes until year 5. Once it starts paying taxes, I assume that it will face an effective tax rate of 30%, which over time will move to the marginal tax rate of 35.50% (S-1, page 211) after year 10. Cash & IPO Proceeds: I add up the cash and short term investments of the company (see page 173) to arrive at a cash balance, which is added to the value of the operating assets. Since I have assumed that the IPO proceeds will be $1 billion and that they will be retained by the firm, I add that value to the cash. Capital & Operating leases: As mentioned in the risk section, I did convert the operating lease commitments of the company (page 214) to debt and added it to the capital leases to arrive at a total value of debt of $299 million. Survival Risk: While young companies with operating losses are susceptible to failure, I will assume that Twitter's deep pocketed equity investors will bring in capital, if the company gets into trouble, rather than leave value on the table. I have assumed that there is a 100% chance of the company surviving. Option overhang: The company has 44.16 million options outstanding, with a strike price of $1.82 (S1- page 207). Halving the remaining life on these options, to reflect the empirical reality that employee options get exercised about halfway through their lives, gives me a life of 3.47 years and in conjunction with an estimated standard deviation from the company of 53.6% (see page 207) yields a value of $805 million for these options (net of tax benefits in the future). Classes of shares: The best news I see in this filing is that there is no mention of two classes of shares (with different voting rights) or special corporate status (which I did see in the Facebook filing). While that may change in future revisions, that does make my job easier in terms of estimating value of equity per share. The net effect of these adjustments is to get a value of equity of $9.97 billion for the equity in common stock and a value per share of $17.36. The picture below captures the various assumptions in the valuation and you can download the spreadsheet with the valuation. If you do not like my assumptions, please change them and come up with your own estimate of value. If you are so inclined, please do enter your numbers in the Google shared spreadsheet that I have created. Having learned from the Facebook fiasco, I expect the bankers and the company to make the Twitter IPO a smoother offering. That process will of course start with the road show, where they will package the company like a shiny new present, and unwrap their “offering” price. I am sure that Goldman’s bankers, working on this deal, are a capable lot and will price the stock well, with just enough bounce to make those who receive a share of the initial offering feel special. As I watch the frenzy, I have to remind myself of two realities. The first is that there will be lots of distractions (like this one) during the IPO, most designed to take my eye of the ball. The second is that the bankers have their own agenda, and I cannot make the mistake of assuming that it matches mine. Watching out for my interests, here is how I see Twitter: at a $6 billion market cap ($10/share), I think it is a very good deal, at $10 billion ($17.5/share), I am indifferent to it, and at $20 billion ($35/share), it is a moon shot. Could I be wrong? Of course, but I would rather be transparently wrong (hence the long blog post detailing every assumption that I made) than opaquely right. I welcome disagreement (though I would much appreciate your phrasing it agreeably). To capture the business risk, should a global beta be used instead of the US beta for each of the businesses or a combination of both? Twitter already generates about 25% of it's revenue outside the US, and the amount would likely increase in the future. Great post! You could use the global betas. Remember that they are not necessarily higher or lower than US betas, just different. In other words, I am just computing the averages for companies globally and not running the regressions against a global index. I am not sure that especially in businesses like advertising and information processing that a global beta is a better estimate than a US beta. Another thing.. why still use beta? why not use a sensitivity table with, say, hypothetical 5-20% discount rate.. I think professor would argue that you could use sensitivity tables across a range of discount rates. However you somehow need to make a judgment of risk, and 5% seems like too low of a discount rate. Professor, when you looked at the margins and sales/capital of comparable companies did you also adjust for R&D and operating leases? Thank you for the post - it is a great learning experience! Sir, as per the model, by year 5 the company will have utilized almost all the cash that they have in reinvestment (after netting for the operating income i.e., internally generated cash from the operations) So, in year 6, in order to hit the revenue target they need to pump in further cash (as debt/equity) or reduce the reinvestment to a level which will be feasible with the operating cash (364.24) My question is how do you address this in the valuation? The definition of a financial lease is that it cannot affect your operating margin. Perhaps, you mean net margin and that has no effect on operating asset value. Looking at sensitivity tables may make you feel better but they won't help you much. You will get a range of values, but ultimately you have to have an expected value. And what 5% discount rate? And you do point to one flaw in my analysis: the comparable firms' numbers were not adjusted for leases/R&D. I will work on that. The company will issue fresh equity. That is almost certain, if it wants to grow this much. That is already incorporated into the model as a negative FCFF and a lower value today. Prof, you estimate reinvestment needs based on sales to capital for all firms (not only for high growth or young technology), is that right? 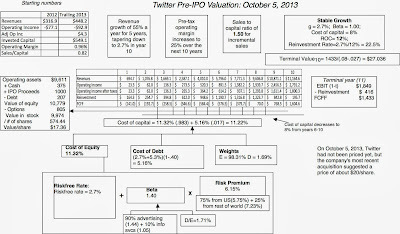 If we assume that twitter's growth would be a more modest 10% over the next 5 years (still well above the best performing economies globally) and a target operating margin of 10% (well above the average if Google and Facebook's current rates are treated as unreliable over the analysis period), then the valuation is much lower. I enjoyed the post and really appreciated the spreadsheet (though it does not work in Numbers it works fine in Google's Quick Office). My take away is that before I invest I don't need to be comfortable with the asking price, I need to be comfortable with the underlying assumptions. Admittedly, that should be obvious, but after trying a few scenarios, a price well under $10 (perhaps a lot under) is more reasonable. Thanks again for a really thoughtful and thought provoking post. Prof do you consider operating margin of 25% is sustainable until perpetuity? On the sales to capital ratio to estimate reinvestment, with mature companies, you can use the same technique. However, if you leave your operating margins and sales to capital ratios at your current levels, your expected growth rate will be the same as the one you would compute with the sustainable growth equation (Reinvestment Rate = g/ ROC). On the question of what a sustainable margin is, the answer varies across business. In infrastructure & manufacturing companies, it will be lower. With technology & service companies, it will be higher. Thanks for your explanation on reinvestment. sir if someone want to start learning valuation from basic how should he proceed. if you are under operating lease, you would be paying rent, rent is usually included in SG&A. As always your analysis & market research are fantastic. My question is the revenue growth rate of 55%, derived from the estimate of 11.5B in 2023? How did you get this? This seems to be the greatest factor in the final valuation. 40% gives 8.95. Half of your valuation. Is this purely an estimate , and nothing more? Don't listen to what accountants tell you. All lease commitments, capital& operating, are debt. Neither should be an operating expense. See my paper on debt & leases. You are right. The revenue target of $11.5 billion is the biggest assumption (the revenue growth rate is backed out from it). That is why I spent so much time looking at the overall market & the biggest players. Given my operating margin assumption(25%) & my generally promising assessment of the company, I feel comfortable with this number but that's just me. No one (including the company) knows what the future will deliver & each of us has to make our best estimates. You include the shares issued for the MoPub acquisition, but is their revenue included in the S-1? The media has reported MoPub at a $100 million run rate. If the lease is not long-term and is cancelable then we can consider it as not a finance lease and take the annual costs as part of operating costs (EBIT). In other words,I would like to consider only leases which are both long-term and non-cancelable as finance leases. Good question about MoPub. Twitter does not mention it in the S-1 and it is possible that MoPub's revenues are not counted yet. Based on May revenues, they had an annualized revenue rate of $100 million. (I think this is just a monthly number multiplied by 12). I will keep digging and if it does, I will add it on but I will also have to add on the costs that come with it. I am not sure whether the net effect will be positive or negative. If your leases are flexible and cancelable (with no penalty), it is okay to leave them as operating expenses. Actually lots of people engage with these Tweets. Standard display ad engagement is a pitiful 0.07% versus Twitter's Promoted Tweets standing in at between 1-2% at the lowest level. In some cases engagement has been as high as 35-50% and this will easily peak during live TV events. Twitter is the second screen after all. That is why their product line is valuable to advertisers with a major concern being a user base which may be slowing down in terms of growth. People are engaging more with these Tweets and will find the ads far more relevant than other platforms. This is proven in so many studies if you bother looking at information away from the company's financials. My personal view is wait for the stock to trade for a few days before taking a position. I believe they are going for a fair valuation and not being too aggressive like FB. I'd expect a fair amount of shorting to occur dragging the share price down before the price rebounds over time. A slight problem perhaps - have you performed a post money valuation using pre money shares outstanding? Your value of equity in common of $9,974 is being divided by the pre money shares outstanding of 574.44, rather than 574.44+50. This won't change firm/equity value in aggregate, but would most definitely reduce the value per share I think. The offering of 50 million is out of the existing shares. If you look at the S1, this is the number of shares after the offering. 215m users refers to Twitter accounts. The actual reach per user base is of greater value. Just as some accounts have 20k followers the reach of those followers propagates to their followers, and so on. Total reach per user and sources is of an exponential value to Twitter. (retweets, external links, and archives) as opposed to individual Twitter accounts as the measure of company value. So that all user accounts effectively follow the user Twitter. From which E is measured to derive or determine actual market value. What an interesting twitter financial statement. Dealing with huge amount to operate business. Hi Aswath... this comment is an unrelated one. Firstly, thanks for all the guidance you give to us. I am looking at some stable consumer names for personal investments and the likes of Campbell, ConAgro, Cadbury etc come to my mind (along with Dabur, ITC, Emami in India, which is my home country). Would be great if you can do an analysis of any of these companies or any other name you're comfortable with in this or similar consumption related sector, so I can use that as a starting point for my analysis. I reckon this sector has been sharply re-rated post Heinz transaction, but I am still curious to see where I can make an entry point. I believe this will also be of interest to other avid followers of yours. While going through the excel valuation sheet, I noticed that while accounting for capitalization of R&D expenses for the year 2011, you had taken the number to be 50.18 instead of 80.18. Am I missing something or was it a typing error? I have gone through your valuation and it makes most sense. However, i was wondering if we should look at it from a different angle. That the revenues are a function of advertisers and the efficiency of the advertisement machinery (sales force) and the advertisement click-efficiency (% of actual clicks/ad displayed). After we do a regression on these numbers, we can draw a growth (or fall) in the efficiency of this to build up the revenue targets. expense items and from there flow into cash flow and valuations. Will be great to know your thoughts. Interesting analysis, very much appreciate you providing your views to the public. One thought: the ratio of sales growth to incremental capital tends to decline in businesses over time as efficiencies are gained and network effects take hold. This is especially true for young companies that have had to invest significant amounts of capital in the early years to grow up to a scale required to prevent competitors from becoming dominant in the sector so that the company can achieve a defensible position and sustainable profitability. My guess would be that Twitter will be able to achieve a much higher sales growth to incremental capital ratio in the future. Interesting points about the sales to capital ratio. There may be networking effects that make the sales to capital ratio higher over time. It is relatively simple to model it in. That said, the business is going to more competitive over time as the overall market (online advertising) matures and competition picks up (from existing and new entrants). If you look at Google's incremental sales to capital ratio over time, you can start getting a sense of what the trend lines may be. I very much appreciated the post! I'd like to ask a question about the discount factor applied to the calculation of the PV of the terminal value. The discount factors applied to the terminal value and to the FCFF in year 10 are the same. That implies that both CFs - FCFF in year 10 and the terminal value, theoretically replacing all future CFs from year 11 onwards - incurred in the same year, which doesn't sound right. Or does it? Given the fact that the value of the company is actually derived from the terminal value - PV of the FCFF in the first 10 years is negative - applying the correct discount factor has not only theoretical but also a practical effect on the value calculation. Many thanks for your thoughts on it. The terminal value is based upon cash flows beginning in year 11 and going into perpetuity is computed as of the beginning of year 11 (which is the end of year 10). That is why it gets discounted back at the same factor as the year 10 cash flow. Placing a value on a aggressive growth stock Its like predicting the weather two weeks in advance. The primary motive in the valuation is the projected growth rate of earnings and sales not the current actual value of the enterprise. If the company falls even modestly short of earnings and sales expectations the stock will get crushed. Sir, was wondering any thoughts on below? Sir, couple of things for your assistance. 1. For calculating terminal value, FCFF/(WACC-Rf), the sensitivity of the denominator is really high for companies where WACC is quite close to 10yr govt yield in some cases. Whats the best way to reduce this volatility? (In one case, I get a 33% change in fair value for 0.2% change in Rf). 2. For sales to capital ratio, since I am evaluating for a company outside US, I didn't use the fixed ratios for industry you guide, but an took what sales/capital ratio (chg in rev / chg in invested capital) mostly averaged for last 10yrs. Here, invested capital is taken as BV of dept+BV of equity. Do you think this is a correct approach? Is this IPO going to be insiders selling their shares or new shares being issued or a combination of both? if new shares are issued then you also need to account for the company retaining the money as well? what do you think about BUSINESS MODEL? AND MANAGEMENT? Twitter is definitely the premier social media platform to advertise your business because Facebook ads have looked more spammier than ever nowadays. "The book value of equity is negative but as an investor, that tells me nothing, and the shift to a positive book value of equity in the pro forma statement matters even less." Pardon my ignorance but could you explain this a little further? I always thinking that negative book value is bad and that those companies should be avoided. Why should an investor be indifferent to it? Still another question on post-money shares outstanding. In the S-1 filing Twitter says it will have 544,696,816 shares outstanding. This is 474,696,816 + the 70,000,000 shares offered, meaning the 70mln is fresh capital and does not come from the outstanding shares. The S-1 states the share count after the offering is based on the 474 million shares outstanding per 30-6. Again excluding the shares in the offering. Could you please re-check as I'm somewhat confused. To those posting these stats "Standard display ad engagement is a pitiful 0.07% versus Twitter's Promoted Tweets standing in at between 1-2% at the lowest level." That is strictly at a view through level. As attribution modeling comes into play, you will see a large focus of revenue move away from display in my opinion. Be ahead of the curve, people are no longer willing to throw money at a 1:5 ROAS when they see the real impact of attribution vs last click methodology or view through attribution. Could you explain how you calculated the cost of debt? Hi. Why were the 42 million + options not assumed to be exercised in the fully-diluted share number? 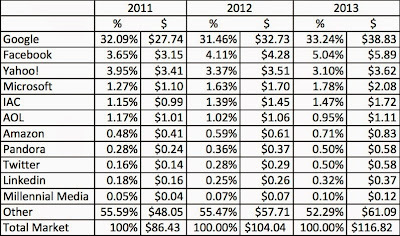 Here is a link to my DCF that shows that the share price is more like: $11.84 per share. I have put forth a more conservative sales growth level of 25% in 2018 which is more in line with FB's growth. Prof. Damodaran - you include stock based comp expense in your future projection implicitly. Would projecting diluted shares and valuing on a FCF/share basis be better? I imagine that has similar problems though.